Prime Minister Justin Trudeau meets with Saskatchewan Premier Scott Moe in Saskatoon, Sask., on Sept. 12, 2018. 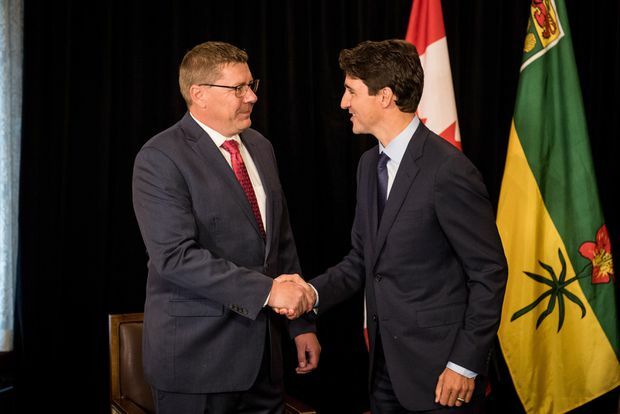 Saskatchewan Premier Scott Moe says “frosty” relations continue with Ottawa after the Prime Minister rejected a request to shelve the national carbon pricing plan. Mr. Moe made the comments Wednesday following a private meeting with Justin Trudeau at the Saskatoon hotel where federal Liberal MPs are gathered this week for a caucus meeting just days before the return of Parliament on Monday. The federal government has approved national carbon pricing legislation that requires provincial governments to enact minimum standards for putting a price on carbon emissions. Provinces had until Sept. 1 to submit their plans to Ottawa. The legislation allows Ottawa to impose a carbon tax as of Jan. 1 in provinces that fail to produce an acceptable plan. In that case, Ottawa says the carbon tax revenues would be returned to citizens from the provinces in which the tax was collected. Mr. Moe and Ontario Premier Doug Ford have launched legal challenges of Ottawa’s jurisdiction to impose a carbon tax on unwilling provinces. Although Saskatchewan is opposed to a carbon tax, Mr. Moe said his province has a serious plan to fight climate change that is based on technology that captures and stores industrial emissions. He said this technology could be exported internationally, delivering “real results” for addressing climate change. While he described his meeting with Mr. Trudeau as “good,” he also expressed disappointment that the federal government rejected his request to abandon the carbon pricing plan. Saskatchewan also asked for the repeal of Bill C-69, a federal bill that overhauls the impact assessment process for approving large projects such as pipelines. Alberta Premier Rachel Notley recently said that her province’s plan to raise its carbon tax beyond the current $30 a tonne will be contingent on the federal government moving ahead with the Trans Mountain pipeline expansion, which is in limbo after the Federal Court of Appeal quashed Ottawa’s approval of the project. Earlier in the day, federal Environment Minister Catherine McKenna said her department is still reviewing the plans submitted by the provinces and could not comment on what steps Ottawa will take. She said Saskatchewan and Ontario are the only provinces that are not co-operating with Ottawa on the climate file.